The holistic approach to equipment management at SES is built on a foundation of technical excellence. The service, skills and knowledge at SES has been gained over many years of experience in the industry. 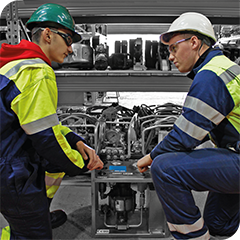 SES firmly believes in developing employee skills for both now and the future and periodically recruits apprentices to replenish the skills shortage in the sector. All of our employees follow a defined training plan to ensure they have the required level of competence to perform their job function; our apprentices follow an approved training scheme that commences with basic trade skills at level 2 and progresses through to HNC/ foundation degree level. Our skilled technicians are trained and approved by many of the leading equipment manufacturers to perform service and repairs of safety critical equipment. The custom built facilities at SES are designed to provide the correct working environment to realise quality equipment that is safe and reliable. Our calibration facilities are environmentally controlled and consist of 8 separate laboratories over 2 locations. All tools and equipment are maintained, repaired and tested in purpose built workshops; all power tools are tested in our noise and vibration assessment centre. SES has implemented assurance systems to ensure the safety and integrity of each item of equipment. Each item of equipment is identified by a unique number and records of inspection and tests are maintained for each item, previous test results are routinely analysed for signs of deterioration, allowing us to identify potential failures before occurrence. A culture of Continuous Improvement is woven into the fabric of the SES business and our processes are continuously reviewed to identify improvement opportunities; this ensures that our customer’s expectations are exceeded by our technical excellence.